My Top 5 Healthy Eating Tips is the first in a series of posts in which I’m sharing how I lost over 30 pounds and became fitter and stronger than I have ever been. None of these posts should be considered medical advice. Always consult your doctor before making changes to your diet or beginning a new exercise regime. Before I share my Top 5 Healthy Eating Tips, I need to tell you something. If you want to lose weight and keep it off, there is no fast, magical, easy way to do it. It took me 18 months to go from a UK size 14 to a UK size 8 (that’s a US size 12 to a US size 6). Fad diets, ‘weight loss cocktails’ (like the cayenne pepper, maple syrup and lemon juice combo), meal replacement shakes and fasting might make you lose weight quickly, but it’s very likely the weight will just come straight back on. Worse, repeated yo-yo dieting can also make it harder to lose weight in the long term. Losing weight sustainably takes thought, time and effort, but it’s definitely do-able. Exercise played a huge role in my transformation but it all starts with looking at how and what you eat. 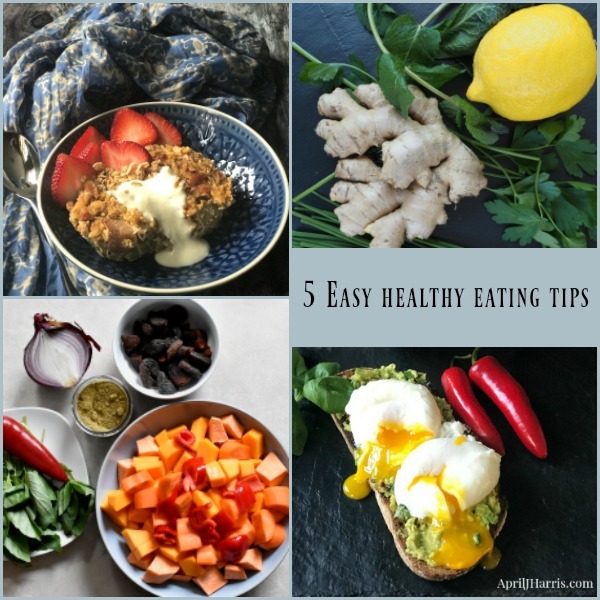 My Top 5 Healthy Eating Tips are simple, straight-forward, and easy to incorporate into your every day life. Protein forms the building blocks that make up your body – your bones, muscles, skin and blood. You need protein to function properly, and you should eat a source of protein with every meal. Eggs, yogurt, fish, meat, poultry, nuts, beans and pulses like chickpeas all contain protein. When you are meal planning, think about the protein first, and then build the rest of the meal around it. Although this was the healthy eating tip I resisted the most, simply cutting back to eating bread only once or twice a week was one of the pivotal decisions I made in my weight loss journey. Don’t panic. I said ‘cut down’, not eliminate – and I’m being very specific about bread and pasta here, not grains. Nobody wants to give up bread and pasta completely unless they absolutely have to. And please don’t eliminate grains unless you need to be on a gluten free diet for health reasons. Grains for a vital part of a healthy diet, and contain lots of vitamins, minerals and fiber. Pasta is a treat, something that should usually be served alongside or as a small part of a protein-based dish. It’s fine to eat it from time to time, but if you find yourself making pasta dishes more than once or twice a week, as I was, you may need to re-think. When it comes to bread, think beyond the sandwich. Sandwich fillings can form a great basis for a salad, and honestly, there are lots of other lunch choices including egg dishes (like omelettes, avocado toast with poached egg and frittatas), stand-alone salads, or veggie and pulse packed soups. Lower carbohydrate crisp breads like Ryvita or Wasa brand can be delicious carriers for what used to be sandwich fillings. Have a wrap instead of a sandwich, or eat your sandwiches open-faced with just one piece of bread. When I do eat bread, I choose wholegrain, spelt, rye and/or sourdough breads that are easier on the digestion. With a shorter rise time and the addition of additives, many modern breads really are not very good for us at all. You will fine that once you get used to hearty artisanal breads, you will really enjoy them,. In fact, I now find that some of the breads I used to love don’t seem like they have any flavour at all. Eating lots of fruit and vegetables definitely helped me lose weight. Fruit and vegetables are filling, full of good for you nutrients and are tasty too. Peas, kale, mushrooms, spinach, broccoli and avocado all contain protein as well. Many advocates of the ‘clean eating’ movement maintain that fruit is too high in sugar to form part of a healthy diet. I disagree. Fruit is full of vitamins and it feels like a treat because it tastes good. Fresh herbs and spices can really enhance the flavours in your food without adding a lot of calories, and some spices (like chilis) may even help increase your metabolism. Sensible portions of healthy fats from a vital part of a healthy diet. They can form part of a healthy weight loss plan too. Examples include coconut oil, walnut oil, rapeseed oil (the kind that is not genetically modified), avocado oil and olive oil. Avocados and nuts contain healthy fats as do many types of fish, especially salmon and mackerel. When it comes to avocado and nuts, you need to watch your portions. Half an avocado will serve one generously and 20 to 30 grams (roughly an ounce) of nuts is a good size serving. In the proper quantities, not only can healthy fats help you lose weight but they also make your hair, skin and nails look amazing! Portion sizes in most restaurants and private homes have gone a bit crazy. We are eating so much more than we used to and indeed much more than we need. A good food scale can really help with portion control. Also, try and avoid really big meals except on special occasions. Eating little and often (3 medium meals and 2 to 3 small snacks each day) can help keep energy levels up and aid weight loss. If your body feels empty it will hold on to the next meal or snack it has. Eating regularly may even help you burn more calories. See? My Top 5 Healthy Eating Tips really are easy! Introduce one or two a week and it’s likely you will see a change in no time. 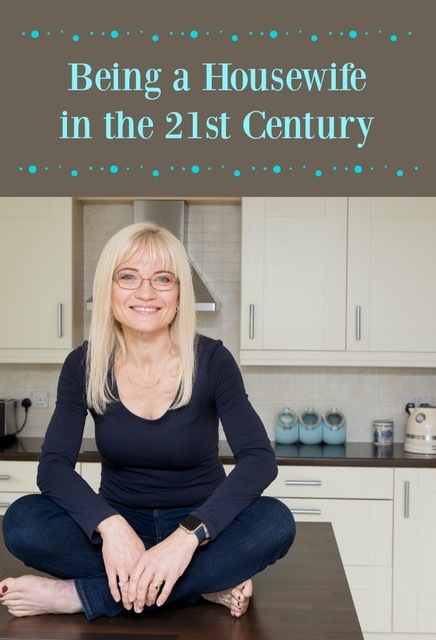 Watch this space for more posts about my journey to a fitter, healthier body – and for great tips that may help you too! Great tips. I am trying to cut back on sugar and breads too. Saw this post at Create with Joy. Thank you, Faith 🙂 Love to ‘meet’ you 🙂 I always enjoy Create with Joy’s Inspire Me Mondays! Oh, April this sounds so easy. My biggest problem is that I LOVE bread :)) Congrats for your weight loss, you look fabulous! I can attest to that, Cristina and April! Nobody loves bread more than I do – I’m a lifelong breadaholic – and I make excellent breads. But I’ve gradually cut back to just having one slice a few times a week. If I can do it, anybody can! 😀 But I think “gradually” is the operative word. I could not have done that overnight. I agree, Jean, gradually is definitely the way forward with most things 🙂 I do still love bread – in fact, my ultimate treat at the moment would be toast and honey or jam!! Great advice April! I do love bread but we just enjoy it on special occasions now! I love the results of eating healthy! Thank you so much, Nancy 🙂 I love the results of eating healthy too! Good and sensible tips April! Thank you for sharing them. Super tips! Cutting back on sugar, including fruits! is a big help for me. And no low-fat foods. I feel and look my best when I prioritize clean foods, exercise outside, and no snacking. congratulations on your weight loss. Like the 5 healthy tips as they seem doable. Great tips and great job! It takes a lot of work transforming your body, the toughest part it sticking it out. Good for you! Thank you, Jaxx. After nearly 6 months of maintenance, I know that it is probably the most challenging part. Especially as I now have to work twice as hard when I’m working out. But it’s totally worth it! Congratulations on your healthy improvements! As a person who’s always been slim, I think the tip about adding flavor with herbs and spices (rather than sugar and fat) deserves its own number separate from eating fruits and vegetables! One of the things I notice about my food preferences, compared to many people who struggle with their weight, is that I’d rather have mustard than mayo, I’ll add cinnamon to coffee or oatmeal before I’ll add sugar, etc. Of course it’s easier when you happen to prefer the lower-calorie option, but by experimenting with different choices you’ll probably find some you like. I’ve found I eat most healthfully when I plan meals around the vegetables but also include protein. When protein is the “main dish,” you tend to eat a larger portion of it, and if it’s meat or nuts or cheese that’s a lot of calories. But if the “main dish” is stir-fried vegetables and you throw in a handful of peanuts for protein, you can eat a larger volume of food for the same calories and a lot more vitamins. I don’t know if this is true in Britain, but in the U.S. most people eat 2-3 times as much protein as they need. I just reread this article and thought, “Didn’t I comment on this before?” and I’m glad I scrolled down to read your update! That is the clearest explanation I’ve seen about why protein is more important in weight loss than in a maintenance diet! Thank you! I will keep this in mind when writing about protein in the future. This is excellent, April! We have been eating this way for the last 10 years or so and every single tip you give is an important part of realizing a healthy weight. Good for you! Thank you so much, Judy 🙂 I’m so glad it has worked for you as well! I don’t think I’ve been eating enough protein, particularly at breakfast time. For years I ate cereal first thing, then (concerned with added sugar) switched to toast + hummus + a hard boiled egg. But it turns out the hummus isn’t much of a protein boost, so I think I need to revisit that. You look amazing!! I am so impressed with your weight loss! And with all of the yummy recipes that you post, it’s remarkable that you’ve been able to lose weight. 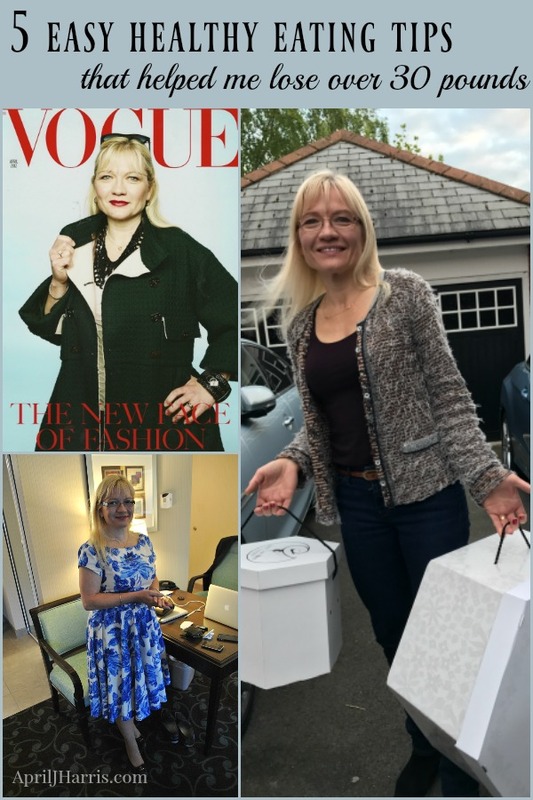 April, congratulations on a very sensible weight loss over a sensible period of time with a sensible way of eating (not a temporary “diet”)! Good tips! I’m embarking on an effort to lose weight currently, so I will work to follow your suggestions! Congrats on your weight loss! This is a marvelous common sense approach. Why is it so hard to remember them when making choices. Congratulations on your sustained weight loss. Its terrific. Congrats on your weight loss!! That’s an accomplishment for sure. These are some very easy to manage tips worth implementing in one’s diet. The bread and pasta tip is the tip I’m resisting now too. I know I shouldn’t!! Thanks for all the tips. Everything you wrote about makes so much sense. I will be thinking of your tips when I’m looking for something to eat! These are all such great tips! I think the hardest part for me right now is eliminating bread and pastas. I’ve taken those out of my diet before, and it’s amazing just the difference that makes! Thank you for sharing! 30 pounds is an amazing amount of weight to lose, but you did it and you look great! I was hoping that I would see these tips in your post and not something about eating cabbage soup five times a day! I know someone who tried to lose weight that way. You have inspired me to eat healthier. Thank you! Thank you so much, Catherine! I’m so glad you feel inspired by my tips 🙂 I hope they help! WOW! This article really useful for me. I confused for choosing the weight loss foods information what would be the best for everything. But review this article my confusion has cleared. Thanks a lot for sharing such an informative article about “5 Healthy Eating Tips” and I’m sure most people can take notes from this article. One thing most people lack experience while aware of healthy food for weight loss. Well, this post will give me much good ideas for healthy food for weight loss and hair. Thanks April Harris and keep it up……. I’m so glad this article resonated with you, Alicia!